The COSLYS Organic Toothpaste Gel cleans and protects sensitive teeth and gums. Thanks to its natural formula of minerals and trace elements, it naturally remineralises the teeth and strengthens the enamel. 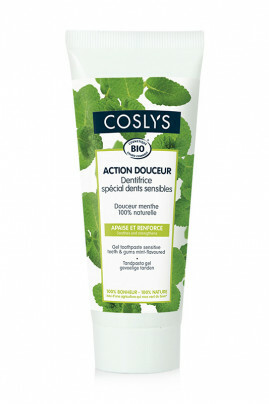 Coslys Organic Tooth Paste reduces the sensitivity of teeth and heals inflammations or irritations of gums. The product also ensures lasting fresh breath ! Enfin un dentifrice Bio qui a un goût et une texture acceptable ! Je recommande ! Organic Tooth Paste of Coslys gently cleans your sensitive teeth and gums ! Organic Tooth Paste COSLYS cleans and takes care of your teeth and gums !